Helping people who are blind or who have low vision. Cleveland Sight Center (CSC) has served the needs of Northeast Ohio residents who are blind or have low vision for over a century. CSC offers developmental, rehabilitation and vocational services to ensure success in today’s society. The services are targeted for all age groups. Our team of optometrists, therapists, employment specialists and other CSC staff are dedicated to assisting our clients live their lives to the fullest. Through education, recreation, training and assistive technology, CSC provides opportunities for those who are blind or have low vision to engage in activities and optimize remaining eyesight. See what's possible at CSC for clients of all ages who are blind or experiencing vision loss below. CSC understands the fears and anxieties associated with the loss of eyesight. We are committed to helping our clients achieve ambitions and goals that they may have thought were unrealistic because of vision loss. CSC is where you can be yourself and become part of an extended family whose members are coping every day with blindness and low vision. 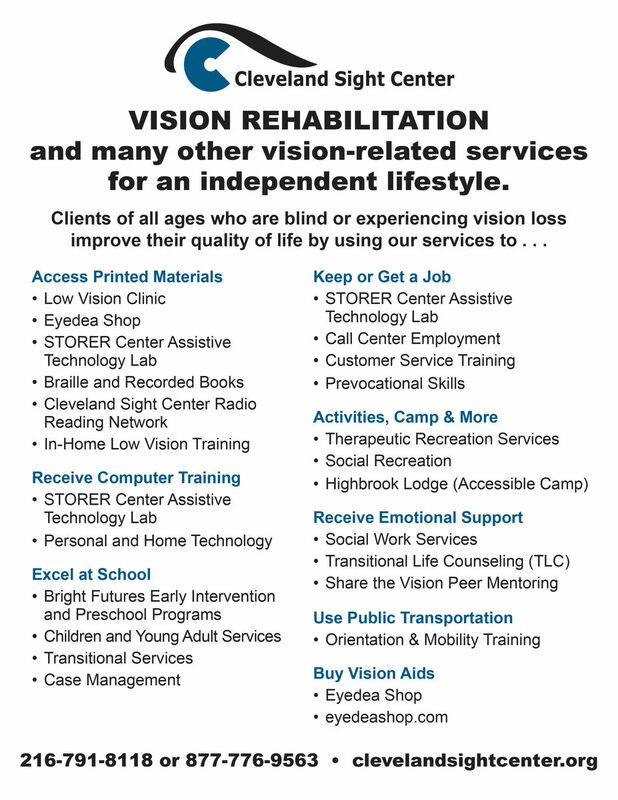 CSC is dedicated to assisting clients to live well with vision loss. Contact us today at 216-791-8118 for additional information, to register as a new client, or to make a referral. CSC’s success is in large part to the generosity of donors. Thank you to all who have offered CSC the financial assistance needed to expand our programs and services. Cleveland Sight Center is committed to values of diversity and inclusion in order to create a climate of respect that is supportive to everyone’s individual success. We take a step beyond simple legal compliance in the recruiting process and employment tenure. We strive to provide an environment favorable to all regardless of race, color, religion, gender, sexual orientation, gender identity, pregnancy, marital status, age, nationality, ethnicity, ancestry, disability, military status, genetic information, protected veteran status, or any other factor or characteristic protected by law. We recognize that the responsibility for diversity and inclusion lies with all at the agency: leadership, administration, staff and volunteers.